The concept plan for Reservoir Park includes a central pavilion, picnic shelters, boat ramps and miles of hiking trails. 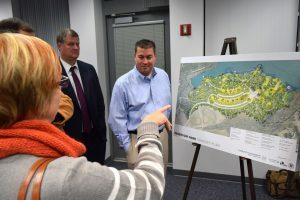 After a year of planning, the designs for a new park at the Beaverdam Creek Reservoir in Ashburn were unveiled during a community forum Wednesday night. After buying the reservoir from the City of Fairfax in 2014, Loudoun Water teamed up with NOVA Parks to manage recreational uses at the site. 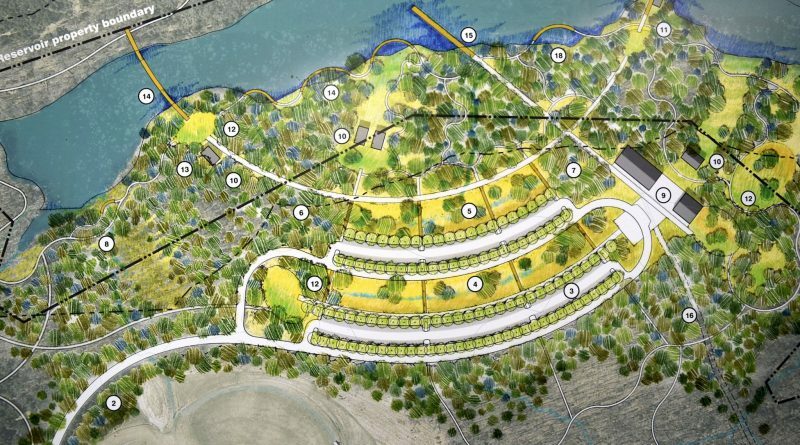 That partnership has blossomed with promises of much improved public access and more community activities—creating a 1,000-acre park with a 600-acre lake. Mark Peterson, Loudoun Water’s executive director of Stakeholder Relations, stressed that the primary focus will remain on protecting the drinking water source. Work with NOVA Parks and a consultant team over the past year has focused on finding a balance that meets that goal while also allowing residents to hike, fish and row on the property. Residents got a first look at plans for Reservoir Park during a Dec. 15 meeting in Ashburn. Landscape architect Thomas Woltz led the development of the concept plan. “It is really an inspiring vision, an exciting project to be a part of,” he told the crowd of residents gathered at the National Recreation and Parks Association headquarters to learn of the plans. Woltz sees the Beaverdam Creek Reservoir property as part of a larger network of parkland and water-filled quarries in the area in the years ahead. “This is like a national park right here in Loudoun County, potentially,” he said. The plan envisions the construction of a pavilion and several shelters along with a boat dock and parking on the south end of the reservoir near the NRPA headquarters. An 8-mile hiking trail surrounds the reservoir. A focus of the project would be to promote ecological education with facilities to accommodate classroom field trips and displays explaining the shoreline ecosystem. “This would be like a living laboratory for Loudoun Water,” Woltz said. NOVA Parks Executive Director Paul Gilbert also is excited about the project and the partnership with Loudoun Water that is making it happen. “You can go fast alone, but you can go farther together,“ he said, quoting the African proverb. 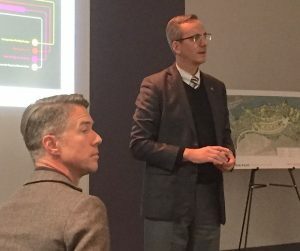 NOVA Parks Executive Director Paul Gilbert answers questions about the new Beaverdam Creek Reservoir Park plans as designer Thomas Woltz looks on during a Dec. 14 community meeting. Implementation of the plan is expected to cost between $7 million and $10 million, Gilbert said. Already, the parks authority has about two-thirds of that money earmarked for the project, but will be looking for other sources to close the gap. The plans could start moving through the county’s development review process next year, with construction eyed in late 2018 and an opening possible in 2019. “It’s three years and a lot of moving parts,” Gilbert said. Before that work begins, Loudoun Water will finish its repairs to the reservoir dam. That work is just getting underway. 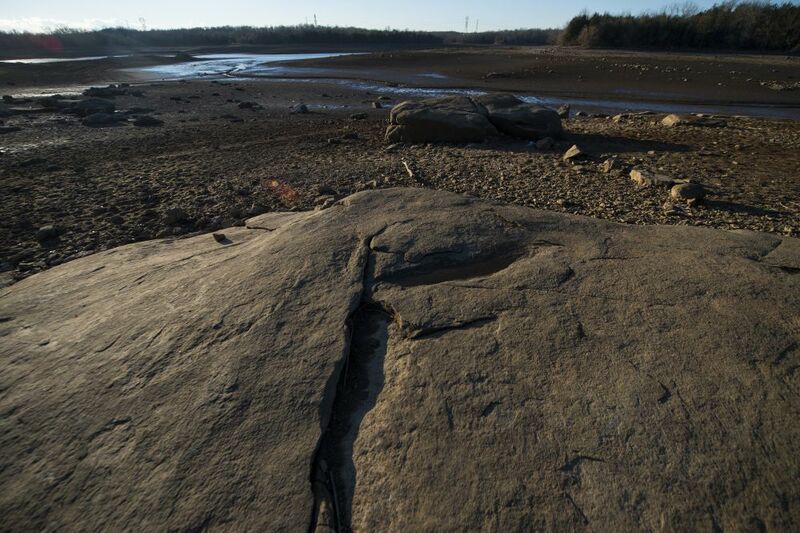 The lake’s 1.3 million gallons of water has been drained in recent weeks, leaving a starkly barren landscape. Now visible on the lake bottom is the former Mt. Hope Road bridge that carried traffic over Beaverdam Creek before the reservoir was built in 1972. The reservoir may be refilled partially next year, but it will not return to full capacity until the dam work is completed in 2018. Loudoun Water staff members said it was too soon to tell whether water-related activities could resume before then. The concept plan presented this week was described as a Phase I project. In the future, work could be done to improve access on the northern section of the reservoir, at Mt. Hope Road on the east and Reservoir Road on the west. This sounds really, really good. 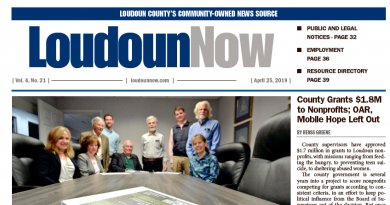 It seems many others will one day be able to explore this untapped resource of Loudoun. Is #14 a footbridge going over the reservoir? Cool.